This is a post I did earlier, but made them again this week for Hannukah, so it seemed like a good time to move them to the top of the blog again. For an even faster and easier recipe you can look to my new book Holiday and Celebration Bread in Five Minutes a Day , where we have an entire chapter on doughnuts and fried treats. Happy Holidays! Amber Wilson’s new cookbook is a delight. It is one of the most strikingly beautiful books I’ve seen recently. The photography and recipes are romantic, sultry, so Southern and yet, they are entirely approachable. When I first flipped through the pages, I wanted to make everything, but these jelly doughnuts grabbed me most. I adore a great doughnut and she delivers. Her dough is scented with lemon zest, then filled with blackberry preserves, but there are a number of other homemade fillings to choose from. You really need to pick up this book. 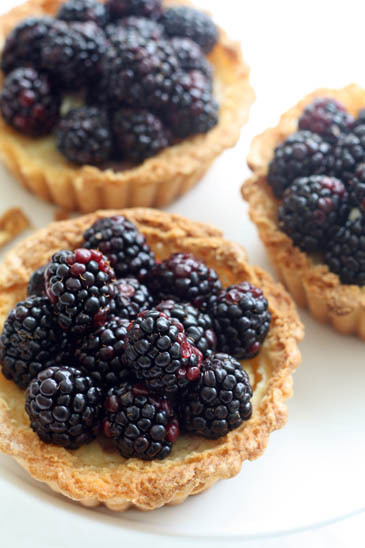 Blackberry Ricotta Tarts, a wee bit of summer in the dead of winter! This past weekend I NEEDED summer. The weather was vacillating between rain and sleet, my boys couldn’t even go ice skating because the rink was just a pool of slush. The Midwestern sky, that I can usually count on for an endless blue sunny backdrop to winter, was gray. It was all too much to take, especially after the Vikings gave up the big game. When I saw the flat of blackberries at the store, I had to have them. It was a gift from a land far, far away that is in their growing months. I am usually dedicated to eating seasonally and as local as possible, but once in a while we Minnesotans have to cheat. It worked, my family and I were much happier after eating these tarts. The fresh berries were lovely with the rich creamy ricotta custard that has the slightest hint of nutmeg. Be sure to use a whole milk ricotta to get the silky texture.